This is the second in a series of blogs written by Jessica Wolfe. 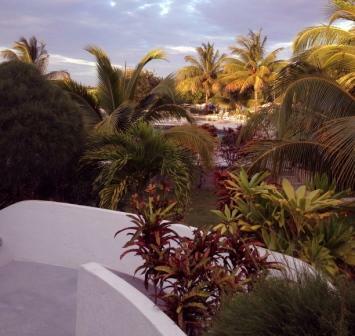 She just recently got her feet on the ground in Belize, and has written about her idyllic experience on Ambergris Caye. Through fresh eyes, she tells us what it's like to arrive on the Caye and meet the friendly residents. If you missed her first story, check it out [here]. Think you have a story to tell? Maybe a secret to living on Ambergris Caye you'd like to share with the world? Send your submissions to joseph.duchene1@gmail.com with the subject line "GB Blog" Your Name. We look forward to hearing from you, and hope you enjoy Jessica's account of her first few days in Belize. Once we land, I gather my belongings, catch a taxi, and take a quick ride to ECI's Exotic Caye office. 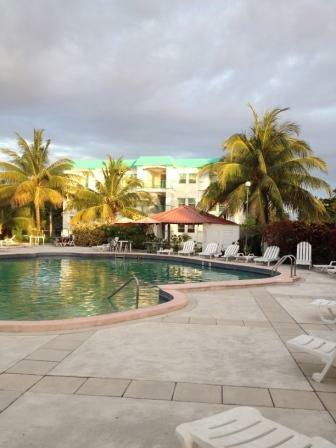 I'm set up to stay at one of two ECI resort locations on the Caye, the Grand Baymen Gardens Community. Upon receiving my key, a fellow Grand Baymen resident named Dennis offers me a ride to the resort in his golf cart. Grateful for the help, I load up my bags and hop in. Dennis has been living in Belize for over 20 years. His skin is tanned and his words are saturated with good humor and joy. "You've caught me just as I was about to make a rum and coke," he jests. "It's a short trip from the office to the resort, no more than 5 blocks, but Dennis and I talk like old buddies about life on the Caye. "I had no clue I would wind up where I am," Dennis muses. "Not a clue." As we pass his building, we stop to catch up with his neighbor, Carolyn, who emanates the same warmth as Dennis. She welcomes me to Grand Baymen and tells me to come knock on her door anytime, for any reason. I can already feel the strong sense of community that makes ECI and its core values so unique. Dennis, ever the gentleman, makes sure I arrive at my room alright. "I would carry your bags in for you, dear, but I'm afraid I just wouldn't be able to. (My bag is huge.) He does, however, open the door and show me how to turn on the air-conditioning unit. Once inside, I quickly unpack my books and toiletries, try my hardest not to get caught up exploring the condo, and slip out to catch what little evening light is left. It is now almost 6pm, and the coastal town is illuminated in a soft, purplish hue. When I arrive in a new place, it's my personal custom to take long, wandering walks - they're always helpful in shaping and sharpening my mental image of an area. here comes that "caught up in the moment" feeling again. Feeling more in a reflective, observational state of mind, I set off down the shore away from the bustling noise of a few larger restaurant bars. As I make my way along, I see a group of families down by the water's edge- there are children kicking around a soccer ball and chasing after their parents. It's just after passing this group that I begin to notice how dark it's becoming and how there doesn't seem to be many people out ahead. Feeling sort of like a yo-yo on a string, I do a sharp 180 and pass by the group again. This time, however, they wave me over. Within a few short minutes, I've shaken hands with everyone, learned far more names than I'm capable of remembering, and have been offered a chair to sit in as well as a local beer I learn that these families get together to have a beach barbeque each and every Sunday. Today, they grilled up some chicken; the plan for next Sunday is to catch fish in the ocean for their meal. "This is a place of peace and freedom," a man named Willis states, out of breath from chasing around two giggling 8-year-olds. "Drop me out of a plane anywhere in Belize and - as long as I have a parachute - I will be a happy man." One woman and her husband immigrated to Belize from Mexico, "This is unlike any other county because of its beautiful reefs, or arrecifes. You will need to explore some." "You should feel safe here, especially in Ambergris Caye. You're in good hands," her husband added. Listening to the sway of the palm leaves, inhaling the salty aroma of the sea, watching the children play and the water glisten in the light of a starry sky, I reflect on where life has taken me today. From the icy cold of Dallas, to the impersonal rush and bustle of large airport hubs, to the warmth of the beach and the palpable sense of community I feel sitting in this circle of happy Sunday barbecuers; I feel like Dennis in the sense that, waking up this morning, I never could have imagined I would wind up in this moment. 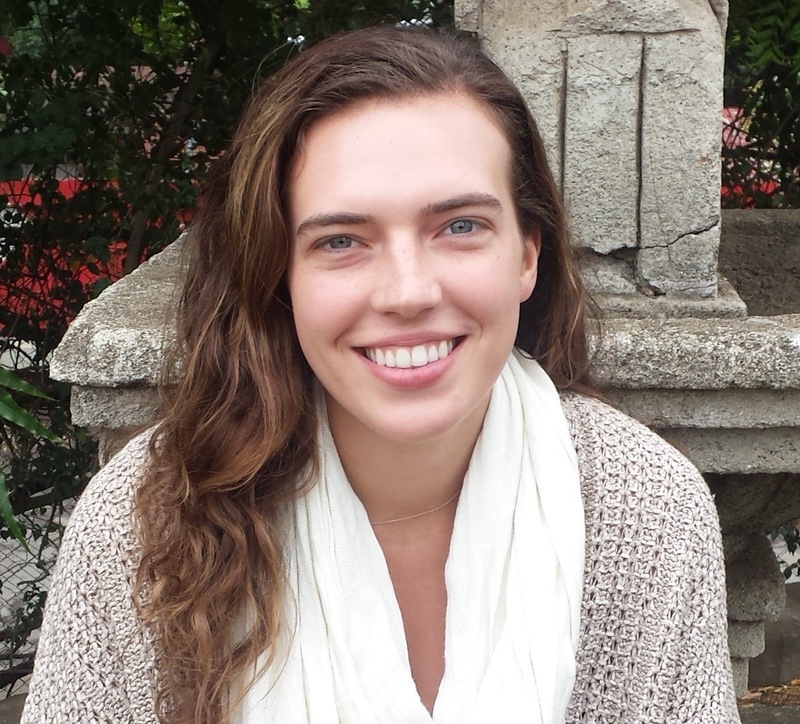 Jessica is a recent graduate of Tulane University, with a BS in Psychology and a minor in Spanish. A native of Dallas, Jessica has lived and worked in South America, and is an avid soccer player and student of culture. She is working in Nicaragua as an intern for ECI Development and is always in search of the perfect avocado.